Sandy Springs Trail (aka Cowert Tract) at Island Ford was maintained by volunteers on May 5. A dozen volunteers debearmed the edges, to allow water to flow smoothly across and off the trail. Nicks and dips were cut into the trail tread in low areas to move more water off the trail, and prevent muddy spots. Want to learn how to talk trail? 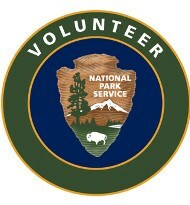 Want to give back to the park? Want exercise with like-minded volunteers?